An occasion for all to discover the secrets of the embroidery "Aari" or "Zardosi" with the designer Shikha specialised in Indian embroideries and textiles (P.G. Diplome in clothing textiles 1995, Government Home Science College, Chandigarh, India). This technique is used by many a western designers to create luxurious garments and fashion accessories. Gold thread embroidery reached great proficiency in india during the height of the Mughal Empire under the patronage of Akbar the Great. The imperial style of metal thread emboidery, called Zardozi embroidery was revived in North India after independence in 1947. However, the threads used now are generally silver or gold coloured copper. The Indian artisans produced embroideries in various styles to respond to the demands of the Mughal Courts and to satisfy the tastes of the Western markets. In the Northern part of India developped in the 15th century a rich and complex embroidery called Zardosi or Aari and was at its peak in the Mughal era. The art declined for the lack of precious metals and for the purpose of high costs. It was again revived in 20th century with the use of plated copper that reduced the costs and gave the same effect. The use of metal embroidery in Indian textiles and costumes, especially the ones used for special occasions or ceremonial purposes, demonstrate the importance of gold and silver within the culture. Zardosi finds mention in Vedic literature, the Ramayana and the Mahabharata, and all accounts of the Sultanate period. The country, from very early times, was known for the use of gold embroidery on a variety of objects including furnishings, trappings, parasols, and equestrian ornaments. The more aesthetic and evolved embroideries were used on court costumes and especially on accessories such as shoes. Zari, means "gold" in Persian, refers to the metallic threads used in weaving. 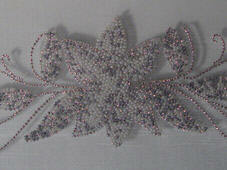 Zardosi embroidery involves the use of different shapes of metal wire like springs, coils, strips, ribbons and discs. Embroiderers carefully select from an elaborate assortment of components to create their own unique designs.The wedding vest is heavily adorned with such embroidery. A legend popular with the zardosi workers of India that relates to the origin of this craft. Strangely enough, it was an account of a shoe, especially embroidered in gold and silver, which was used to hit the reigning king on the head as it was believed to cure a specific brain malady. Of all the crafts of the country, the zardosi seems to have flourished and survived to the present day like none other. Ari Embroidery is equally old and famous for its heavy work. Prepared with the help of an awl it represents a cobbler’s stitch, which requires considerable skill and practice. 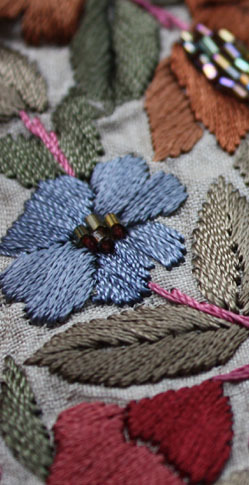 The sharper and finer the hook of the awl, the more refined the quality of the embroidery. The garments under the spell of Ari embroidery are usually dotted with bootis (motifs), which round off with big sized ones known as Nadir Shahi booti. Ari embroidery is done primarily by the Muslim cobbler community in India. The designs are of Mughal origin since the art was at one time patronized by them. The richness of gold may no longer grace the work of zardosi craftsman, but the glitter and glamour endures, hopefully, for all years to come. Zardosi is as tenacious as the wires the craftsmen work with. Open : Monday-Saturday 2:00 pm to 7:30 pm.